​This recipe is a happy 'accident' - an example of how good things come when we let our creativity and curiosity flow. I do my best not to waste food, so I'd frozen some odd bits of fruit that were about to go off. This particular morning I got them out of the freezer, dropped them in the blender and added coconut water. Sensing the result would be too sweet I added cacao powder, which is bitter. BINGO! It tastes like a dessert! 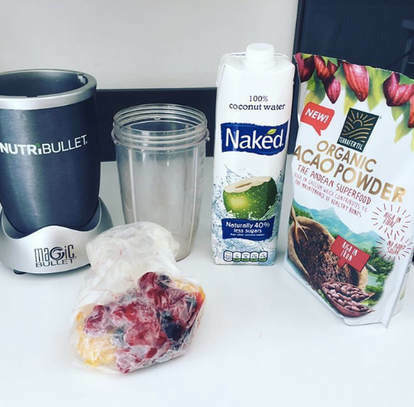 Drop handfuls or whatever you have of the fruit in a blender, followed by coconut water until you can see that's about the right amount - trust your eye. Whizz together, then add a teaspoonful of cacao powder and blend again. If the fruit isn't frozen, add a few ice cubes and enjoy!